During an interview with the news channel Al Jazeera, film historian Daniel Smith had a BBC Dad moment as he was unexpected joined by his son, who took quite well to the camera attention, as we all did to his adorable presence during a sombre discussion. If you’re on social media or even watch fun videos habitually, then there no way you would have missed the BBC Dad of 2017. Professor Robert E Kelly and his family have made it to the social media Hall of Fame after his kids walked into the room as he was giving an interview to the BBC, live on air. Well, it’s a new year, and a new dad on a new channel. 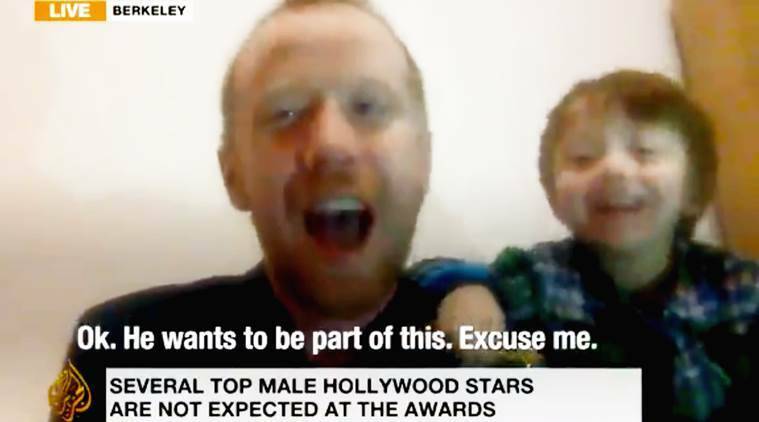 Al Jazeera recently posted a video of an interview with film historian Daniel Smith on the social statement made by actors at the Golden Globe Awards on Sunday night, when his son walked into the frame, and insisted on sticking around. Clearly taken aback by the intrusion, Smith softly pushes his son away but the news anchor was more than happy to have his kid on air. Interestingly, the interview continued and once it was over the little boy waved goodbye as well. Al Jazeera shared the video on Twitter, much to everyone’s delight, but a clearly embarrassed dad Smith replied saying that the door was meant to be locked. Thank you #Aljazeera. The door was meant to be locked! But perhaps it’s good to have some levity in the midst of tackling some serious issues.